In order for you to be using the correct products, you first need to know what type of skin you have. The majority have a combination of two or three types but it is essential to be using the correct products, as too much of the incorrect products can cause premature ageing, fine lines, dehydrated dry skin is the products are too harsh. Skin types can change with stress, climates, diet, hormones. Good skin can make you look healthy. Achieving a clear complexion is a goal for everyone. The appearance, texture and look of the skin is an important factor for most people of any age. The skin is one of the largest organs in the body. The skin reflects emotions, it changes constantly and because of its location it is very vulnerable to damage. Many things including nutrition, hygiene, circulation, age, immunity and genes all affect the state of the skin. There are four basic skin types: normal, dry, sensitive, and oily. This is when you have characteristics from one or more of the four skin types. Characteristics of sensitive skin can be present in all skin types. Sometimes the overuse of harsh products causes sensitivity. 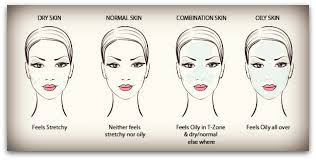 The most common form of combination skin is a greasy centre panel known as the T zone with dry areas on the neck and cheeks. I hope the characteristics above help you to identify your skin type. Once you know your skin type it is much easier to get products which work with the skin type you have. Next week I will be doing a post on the different types of products available ranging from cleansing milks to creams to gels, and the different type of moisturisers out there.